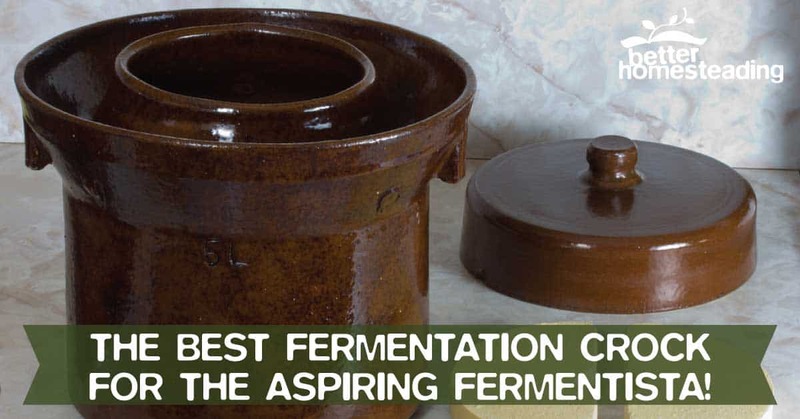 Homestead Kitchen > Fermentation > The Best Fermentation Crock For The Aspiring Fermentista! Hi there! In this article I'm going to be looking at how to choose the best fermentation crock for making sauerkraut, kimchi, curtido, and all manner of other totally delicious fermented goodies. As I mentioned in my recent article on how to use a fermentation crock pot, jars can work fine when getting started, or if you only want to produce fermented food on a small scale. Many people are keen to produce gut-healthy, probiotic fermented foods at home these days, the clear links between a healthy gut and overall health are becoming clearer and clearer. But choosing the best fermenting vessel can be overwhelming, with so many differing viewpoints, plus the perceived high price of ceramic crocks (it's not true) leave people fermenting in makeshift vessels made of plastic, not the best when you are creating an acidic environment. But the beauty of fermentation crocks, other than the beauty of the designs and just the look of them (which I really like), is that they allow you to do much larger batches, and to have a much better level of control over the process. You can also use it as a pickling crock to make tasty pickles. I'm going to be looking at some of the best fermenting crocks currently available, providing some background on them, look at the positives and negatives of each one, and hopefully by the end of this article, you'll have a good idea on what might suit your personal needs and budget. Here's my verdict. I've highlighted 5 great crocks in total, 4 of them with a 5-liter capacity, and one humongous one with a whopping 26 liter capacity. Trust me, that is a lot of sauerkraut! I truly think that for the home fermenter, producing for themselves and for their immediate family, a 5-liter model works just fine. If you're thinking of doing some small scale production as a business, then the 26 liter crocks are epic, and not significantly more expensive than a 5-liter. Let's take a look at how these crocks work before we dive in. If you're super impatient and just want to see the models I recommend, click HERE to scroll to the fermentation crock reviews section. What Is A Fermentation/Fermenting Crock? 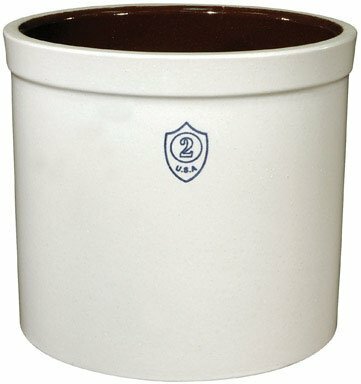 Can I Use A Food Grade Bucket For Fermenting? Fermenting crocks have been around for thousands of years, in various styles depending on the culture. In Korea, they have used earthenware crocks for making kimchi and other fermented vegetables, burying them in the earth to maintain stable temperatures. I'm not suggesting you bury you crock at the bottom of the garden. A cool place indoors is just fine. 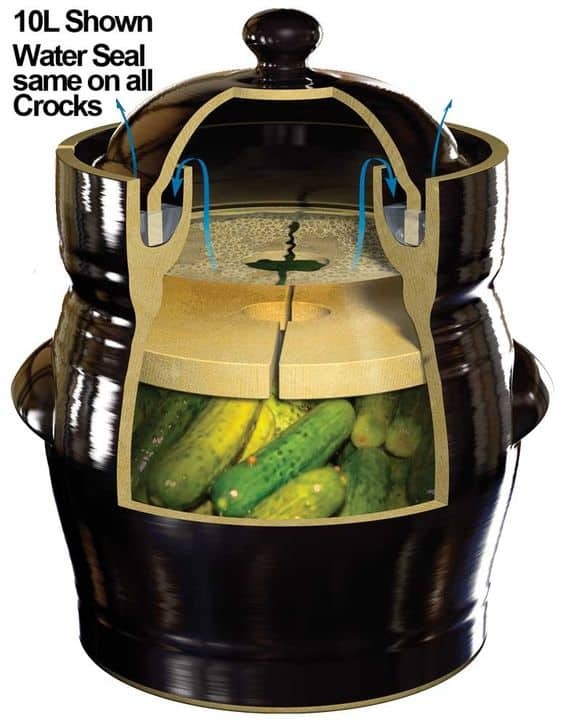 There are essentially a couple of types of crocks for fermentation, open or closed. I'll cover each of them in a moment, but first, a super quick 101 on how these crocks work to provide the correct environment for fermentation to take place. If you're totally new to fermenting, take a moment to check out my how fermentation works article. The cliff notes version is that when we submerge vegetables (or fruit) under liquid, in an environment where there is no access to oxygen, a process called anaerobic fermentation occurs. The micro-organisms, yeasts and bacteria on the vegetables or fruit (no need to worry, they are natural, harmless and good for our gut health) begin to feed on the sugars that are released from the vegetables/fruit (from now on I'll just say vegetables, but take it that this also applies to fruit too). The waste product these healthy critter produce is called lactic acid and this is why fermented food and drink has a slightly tangy flavor. The cool thing is that the fermentation process, as well as increasing the shelf-life of the vegetables somewhat, produces literally millions of bacteria that help to repopulate your gut and improve health. So, we need to exclude oxygen from reaching the fermenting vegetables as much as we can. The crock works a lot better than simple jars because it is designed with a gutter or channel that is partly filled with water. When the lid is put in place, the bottom edge sits in this water-filled channel. As fermentation takes place, gas builds up inside the crock. This positive pressure is released, one bubble at a time as the pressure forces it's way under the bottom of the lid and out to open air. Because the pressure inside the crock is higher than outside, air from the atmosphere is not able to enter the crock and spoil the vegetables. This simple system makes fermenting so much easier, once you start using a crock, the ease and simplicity of the process is wonderfully liberating. The closed style crock typically features a ceramic earthenware crock pot with a capacity of between 5 and 30 liters, although bigger ones are used on a commercial basis. Their design, as you can see in the above image, has a deep 'v' or 'u'-shaped water gutter in which the lid sites. This gutter, when filled with water, creates an airtight seal that can only allow gases (at a higher pressure inside the crock due to the fermentation process) to escape, but no air to enter. These crocks have German origins, where making sauerkraut and other fermented vegetables has long traditions. They offer a really simple and efficient fermenting solution to the beginner and experienced fermentista alike. Easy, care-free ferments. Far less attention needed. Minimal maintenance. You need to make sure the water channel is filled. Not a big deal. Due to the neck width, you have to use slightly smaller vegetables than with an open crock. Due to neck/shoulder, cleaning is a 'little' more trying than an open crock. Generally more expensive than open crocks. I believe the advantages far outweigh the extra cost. An open crock, as the name implies, is open at the top. It has no lid or water gutter. These crocks are typical of the type you'd see in a 1950's home, with food being pickled, and a cloth keeping the flies out. Fermenting in an open crock required the same air free environment as the closed crock. But without a lid you have to be a little more precise. The vegetables are packed into the jar as normal, and the brine liquid used to cover the cabbage or veggie of choice. A plate slightly smaller than the internal diameter of the crock is placed inside to hold the vegetables below the surface. A weight is sometimes used to assist. A dense weave cloth is placed over the top of the crock to keep the bugs out and prevent contamination of the ferment with external pollutants like dust and other particles. Open crocks can work great, if you see any in a junk shop or sale, pick them up for sure. They do offer some advantages in that they are easy to pack and unpack, not typically having the narrow neck of the water-sealed models. 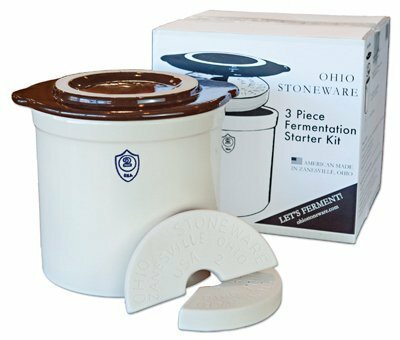 The Ohio Stoneware 2 Gallon Bristol Crock is a great choice, you can also get a lid and crock weights for that model. For more information on these beautiful crocks, check out my in-depth article on Ohio Stoneware fermentation crocks. Enjoy! Usually cheaper that a water-sealed crock. One can improvise with a variety of earthenware containers, provided they are glazed to food standards inside. Super easy to keep clean, open top and wide neck make filling easier too. Easy to add larger vegetables. Harder to keep the air out, ferments are prone to mold and other bacteria. Easier for flies and other insects to enter. Hygiene is ESSENTIAL. Internal glaze may not be too food grade standards, particularly on older crocks. You need to purchase ​fermentation lids and weights separately, which drives cost up. Harder to create the stable environment for the best fermentation results. Any open, plastic container is really an open crock. Open crocks can work fine, providing you can keep harmful bacteria out, but also prevent air from reaching your food. Of course, this 'can' be achieved, but a water-sealed crock makes things a whole lot easier, and requires less ongoing attention. The biggest concern is the ability for chemicals to leach into your ferment from the plastic. Even BPA-free plastics (plastic itself is a mix of chemicals) can allow unwanted, and potentially harmful substances to leach into the food. On the whole, I avoid them. A decent ceramic crock is a one off purchase that will last a lifetime. The small upfront investment is worth it in my view. 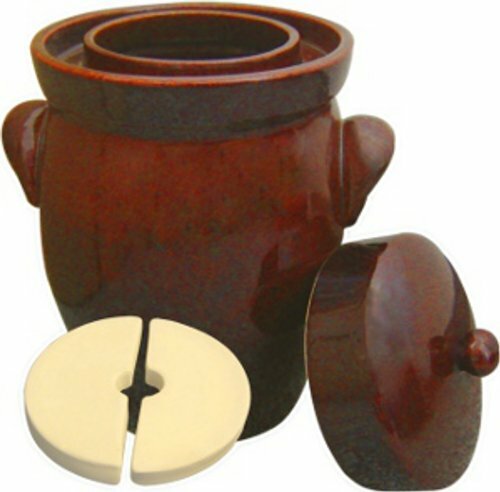 Many of the ceramic fermentation crocks you will find online are of a high quality. You can also find some really nice artisan ones, in amazing colors and styles. However, there definitely are a few things to look out for when buying a crock for fermenting. Here are a few pointers to make sure you get a great product that will offer you many years of stellar service. Always be mindful of the origins of your crock. The German fermenting crock is considered to be best in the world, with much history and tradition. But as with almost everything these days, many of these ceramic fermenting crocks are being replicated around the world, with scant regard for safety. Fermentation creates an acidic environment, the last thing you want is paint, glaze and processing chemicals leaching out of the crock and into your fermented vegetables. I'd highly advise sticking with German and other European manufactured crocks, where standards and quality control are high. American made home fermentation crocks are also a good choice. What Quantities Of Fermented Vegetables Are You Planning To Produce? When you first get started, a 5-liter fermentation pot is usually perfect for a family, and even for some small scale production to sell or give away. Mine has given stellar service and I have no need to upsize at this time. If you are planning to create your own cottage industry making sauerkraut or other ferments, then I'd highly advise having 2 5-liter crocks, or perhaps even a 15-liter or larger. You can produce really large amounts of produce in these larger crocks. The price for a 20+ liter crock isn't anywhere near 4 times that of a 5-liter, so there is definitely an economy of scale factor at work here. Just for the record, a 5 liter crock can easily accommodate 3 large heads of cabbage. A 7.5 liter model can usually take 4-6. A 26 liter monster crock can take 15-20 heads of cabbage. That's a LOT of cabbage!! Do You Need A Moveable Crock, Or Can It Stay In One Place? This might seem like a strange point to make, but it's worthy of consideration. A 5-liter crock crammed full of cabbage and liquid isn't light. As you'll see in the crocks below, they don't come with massive handles. Adequate yes, but imagine trying to move a 26 liter one from cupboard to countertop. The thing probably weights over 30kg when fully loaded. That's quite a weight to shift around. Definitely worthy of consideration at this stage. Open Topped Or Water Sealed Fermentation Crock? I'll mention this briefly, but my personal view is that if you are going to go to the expense of buying a stoneware crock, buying one with the water gutter airlock setup is really the best way to go. Sure, an open topped crock can work great, but you have to ensure the crock weights keep the cabbage under the surface of the liquid at all times, and that the crock is covered to prevent dust and insects getting in. They do tend to be a little cheaper than the airlock style German crocks, but in the grand scheme of things, I'd rather pay a few more bucks and save a load of time and effort over the long term...yes, I'm kinda lazy! The water sealed fermentation crock adds an extra layer of protection and ensures the essential anaerobic environment is maintained. It takes away a lot of the hassle and guesswork that open top crocks or fermenting jars create. I've covered many of the benefits of a water sealed crock for fermenting vegetables, but there is another great benefit to using heavy (relatively speaking) stoneware crocks with a lid and water gutter. This is to do with temperature control, and the exclusion of light. The thick walls of the German style crock really help to maintain stable temperatures, which is ideal for a full flavored sauerkraut. This doesn't mean that you can just stick the thing on a windowsill in the middle of summer, but the type of sauerkraut fermenting crock I'm detailing her will help to maintain a perfect environment for fermenting. If you do use jars, keeping them out of the sun, but ideally in a dark place, will help ensure a good ferment too. As I mentioned a little earlier, providing you are buying your earthenware crock from a European of US manufacturer, you should get a great product that will serve you well for many years. Here is a round up of some of the best crocks available for home fermenting. The TSM company are one of the leaders in fermenting crocks. Robust and beautiful design make these a great looking crock that will do the job. 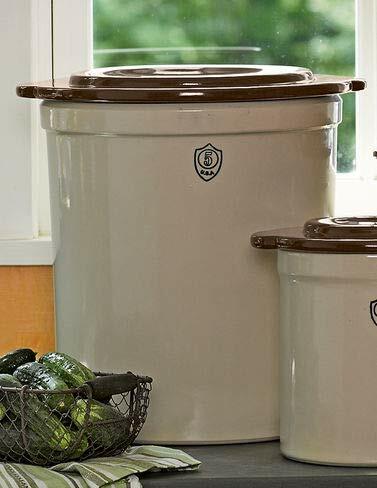 This particular model, the TSM 5 liter 'Harvest' crock pot is made of the highest quality fine-grained and lead-free glazed (very important) stoneware. It's a really lovely looking crock which is flawless in appearance. What I really like about this one is the simple buy aesthetically pleasing design, the deep water gutter and also the small cut out on the lid to assist with the release of gas during the fermentation process. The TSM is a good crock, no doubt about it. As I spent time exploring this crock, I did see a theme start to appear around people who own it. Many people were concerned about the relatively thin walls in comparison to other similar products, and also issues with glaze quality. Although wall thickness is probably not going to be an issue that has any real effect for most users, glaze quality is important. I always get a little concerned when I read this type of feedback, but on the whole, the TSM product is well-received and the vast majority of feedback is extremely positive. The Nik Schmitt German Gairtopf fermenting crock is fantastic. Gairtopf are a German company with a patented gutter system and are one of the most successful harsch crock manufacturers, selling their crocks all over the world. Comes complete with lid, crock weighting stone and instructions to get started. I really like the look of the Nik Schmitt crock. It's elegant and is a perfect addition to the kitchen. The water gutter is wide and shallow, which is absolutely fine, but one will need to keep a closer eye on evaporation than on a model with a deeper gutter. This is a strong, durable heavy crock. The 5-liter is ideal for a small family, but there are larger options available. Be aware of the weight of a filled crock when deciding. This is the 5 liter crockpot that I own and use for fermenting everything from sauerkraut to curtido, and kimchi to carrots. It's been subject to almost weekly use and I love it. Manufactured by Kerazo, this really is a high quality crock. Bias aside, I've compared this with crocks owned by some of my friends, and I feel like I made a great choice, albeit by accident with little knowledge back the. The Kerazo crock is lead and cadmium free (as all good crocks should be). It has a deep water gulley so doesn't suffer from the evaporation issues that some others do. I typically have to add a little water to the gulley every couple of days. The handles, although not large are well designed and do the job just fine. No close shaves in two years...phew! The body is formed in a single piece, no joins at all. The .6" base and .4" walls are super durable, and the whole crock has a sturdy, utility feel about it which I love. Comes complete with lid and weight stones. Sorry, I don't want to go on too much about this one, but it really is a great crock. Sturdy, doesn't feel like it would shatter if you knocked it. Handles that work as handles! One thing that I really like, and it took me quite a few ferments to work this out, is that the weight stones are really a good size when the crock is almost full. I've got friends with crocks with wider neck openings, and the stones just fail to keep the vegetables under the liquid surface. With the Kerazo, fill the crock to 3-4" below the neck, cover with brine and then insert the stones. They wedge in beautifully to hold the cabbage down. Once I got this worked out, fermenting was even easier. 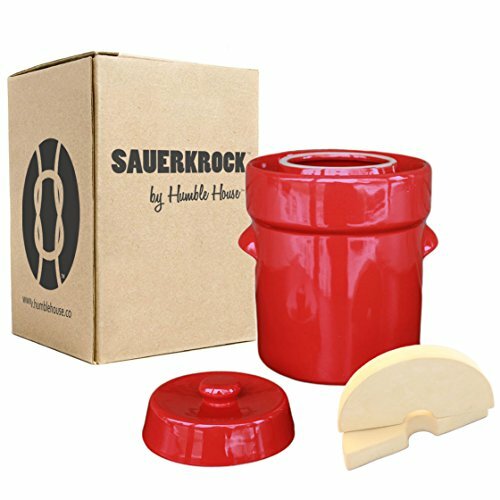 The Humble House German-style fermentation crock is a 5-liter (1.3 gal) crock that is at the lower end of the price range. It's definitely not cheap and cheerful though. 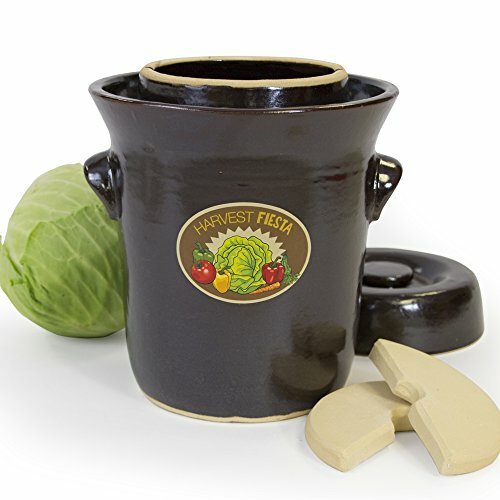 Ideal for fermenting sauerkraut, kimchi, pickles and curtido, this crock is constructed of thick ceramic and as with all the models here, is glazed with a lead and cadmium free finish. The 5-liter capacity makes it ideal for a family of 2-4 people. With looks very much like the Nik Schmitt, this crock is made in China, which is not a problem, but many people seeking a true German crock can become a little aggrieved that the Humble House is made elsewhere. Humble House call this a 'European Style' crock which overcomes the issue. One the whole, the Humble House crock is not bad at all. Irrespective of origins, this crock will stand up well to regular use. I don't believe it is in the same league as the Kerazo, but if your budget is limited, this one is fine for sure. The Nik Schmitt retails in the same ballpark for price, with the TSM coming in a fair bit cheaper. These budget crocks are all good, but if you are looking for a long-term relationship with fermented vegetables, spending that little extra could be worth it. This 26 liter MONSTER crock is the big brother (or sister) of the 5-liter Kerazo that wins my best pick award. The styling is the same and the specifications are also the same, other than capacity. A 26 liter crock is for the small scale producer of the BIG family. Ideally suited for feeding 10-12 people a regular diet of sauerkraut or kimchi, this sauerkraut crock is going to be REALLY heavy when loaded. The crock boasts large handles for easy transporting, but I'd recommend loading and emptying this in one place, rather than trying to lift it in and out of a cupboard. This crock is not for the faint-hearted. If you choose this beast, be prepared to fill it. It's possible to ferment smaller batches in a large crock, but a lot of air will be held within the crock, and it'll take a long time for those gases to expel that air through displacement. It's always best to go for a crock you can fill. This video shows you just how easy it is to make kraut in your crock. I have no qualms in recommending the Kerazo K&K Keramic crock as my best pick. Yes, I own it, but my experience with it and familiarity with other brands makes me sure it really is a great crock for anyone looking to get started in fermentation, or just up their production. The Karazo crock is designed to last a lifetime, as long as you don't drop it on the floor. Products no longer seem to be built to last, so it's really refreshing to see come crocks (in fact, most of these in the review) being made to last more than a year or two. So, here it is...my champion! Thanks for reading. Fermentation is really gaining some traction again, people are realising how important this food source is to our health and wellbeing. Raw fermented food is hard to buy in the shops, if you can get it, it's sold as an artisan product with a price tag to reflect that. Making it yourself is easy, rewarding and cheap. The crock requires some initial outlay but makes life so much easier than using jars. Good luck with your fermenting adventures. 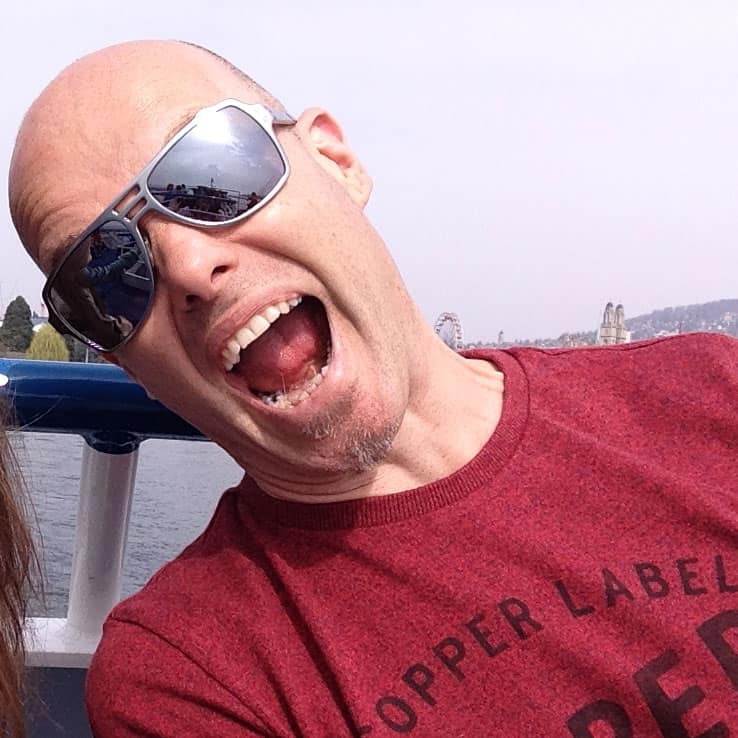 Leave a comment to let me know what crock you use, if you even use a crock at all? Would love to hear your thoughts. All the best, and have fun fermenting! Hi – Just wanted to say a big thank you!!!! I bought a crock just before I found this article, but then having read it, I took your advice and picked up the 5 liter K&K one, they both arrived within a couple of days of each others, so I was always going to be able to return one for a refund. I was actually quite surprised when I put both of them alongside each other. The first one (I won’t mention the brand) was obviously made in China, and although it looked great, the thing was a real lightweight when compared to the one you own, and recommend in this article. If I hadn’t read this article, I’d have been happy with the original purchase, but being able to compare like for like has shown that the K&K is much heavier, more durable, and looks awesome too. The deep water gutter you mention is really great on the K&K, a lot shallower on the other one. Thanks for all your good work, I like the way you write! What can I say? Thanks for the detailed reply. I’m so happy that my evaluation has helped you. All the crocks I mentioned here are good, it’s not that any of them are total rubbish, but I do see more and more Chinese imported crocks flooding the market (no offence to the Chinese), and a lot of these are just individuals starting a business in an area where they see growth, importing ‘ok’ products from China, having them sent directly to Amazon who do all the sales and fulfilment. Sure, some of these importers are honest and do it for the right reasons, but I don’t think one can beat the experience of someone who actually uses this stuff every week, lives it and gives their honest opinions. I always favor real people’s opinions, or at least let their views be part of my decision making to some extent or another. Sounds like you ended up with something good, hope you didn’t have to pay to send the other one back, assuming that is what you did?